Don't know yet what to get your little girl for Christmas or for her birthday? This site reviews the best gifts for girls including toys, games, apparel and other personalized gifts for girls. You'll find something for 1-year olds, 7-year olds, 10-year olds and even teenage girls. I have three daughters who are ages 8, 11 and 13 years old. If you have little girls like me, most likely you know how challenging it is to go looking for a birthday or Christmas gift that they would like. When thinking of buying a gift, I try to look for something that my girls will appreciate time and time again and not just like it for a short while. Additionally, I would like something that lets them use their creative talents. And of course, it must be affordable. 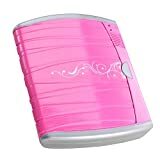 One gift suggestion that I think is a great gift for girls is a personal diary. Why Give a Girl Her Own Personal Diary? It helps her express herself. Any little girl who has learned to write, draw or doodle can benefit from having her own diary. Journaling can help her to express her thoughts and feelings any way she wants. Because it's her personal diary, she doesn't need to be afraid that somebody might read it and scold or embarrass her. Young girls could also increase self-confidence as they learn how to convey their inner thoughts in a different way. It keeps her childhood memories safe. My daughter often writes on loose pieces of paper, which later can be seen just lying around and then lost or thrown in the garbage. Having a personal diary can help a child be more thoughtful on what she writes. It can teach her to treasure special moments and keep those childhood memories for years. It helps her cope with life's circumstances. Journaling also offers the advantage of helping a child handle life's circumstances. One's diary serves as a safe place that the child can go to whenever she's happy, sad or lonely. By writing down her thoughts or feelings on it, it reduces stress, helps with clear thinking and establishes new problem solving abilities. Young girls reap therapeutic rewards by using a diary to express their emotions. For example, a child going through a move or coping with changing schools may be scared of those changes, but can discover consolation in writing or drawing with regards to those sentiments. It allows her to follow her own creativity and style. There's no single rule when writing in a diary. A child can have her own writing style and be as creative as she would like. She can write haiku or poems, compose songs, talk to God by writing down her prayers, draw cartoons or anime... anything. Plenty of diary kits come with personalization options, such as stickers, gems, stamps, that the child can use to decorate her diary. It can feature and highlight the child's own creativity and style. Different designs of diaries are available in the market today. I will show some examples below with a description of their features. But first, we need to know what options or features are available when choosing to buy a diary for your little girl. Journals that could be secured are a means for young girls to pour out their feelings onto paper without having to worry that somebody can inadvertently (or intentionally if there are younger brothers and sisters) read their honest thoughts. From complaining about school to giggling about young boys, having the peace of mind of a protected diary provides girls the liberty to talk about what they give thought to that and much more. There is no better means to ensure that personal thoughts remain personal with a diary that has a lock and key. Most diaries,like the Alex Toys Craft My Own Diary, have this feature and it does not jack up the price of the diary on the whole. However, how secure it is depends on the quality of individual products. A diary that offers tighter security is one that make use of voice-activated password. A built-in microphone is used to record the voice, which is recognized as the password. The diary only opens when the owner speaks the magic word. Would you like to know if somebody has been creeping around attempting to read your own personal thoughts? An intruder alert feature may also be available in some products which lets the owner know that someone is hacking into her diary. Some diary kits include embellishments, such as stickers, gems, glitter, etc, which can be used to personalize the diary. It's one way that your girl can give the diary a unique look even if her friends has the same basic diary. Some diaries include a pen with invisible ink, so regardless of where the user is, she could write whatsoever she desires, including her secret crushes, irrespective of where she is or who is looking. Only the special light that is included with the pen discloses what was written. Alex Toys' Craft My Own Diary is a fantastic gift for the independent, artistic girl. And it’s less than $20 therefore it won’t hurt your wallet! This diary kit includes a variety of decorative stuff -- gems, ribbons, glue, beads, one gel pen, and glitter, so she could devote several hours decorating the cover of her journal to make a personalized diary. It has a lovely purse design that lets your girl bring her journal with her anywhere she goes. And it's got a gorgeous heart shaped lock to keep every one of her secrets secure and tucked away. There's also an attractive heart-shaped bookmark, which can likewise be embellished. This cute diary is perfect for any girl to keep her memories by writing and sketching for many years to come. The National Parenting Center has given its “Seal of Approval” for this product giving moms and dads the assurance of a good product. 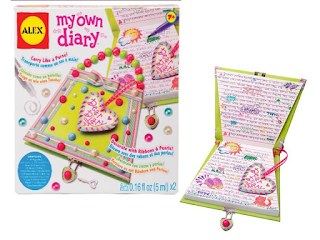 This diary kit it not just a toy, but a cherished keepsake that your child will delight in several years after. The Password Journal is a number 1 bestseller in Amazon in the category of kid's diaries. Truly a great gift for young girls. What makes the diary stand out from other diaries is the use of voice activation. It uses a microphone to create the voice recognition password, which gives access to the use of the diary. The only complaint of some users is the sensitivity of the unit to the owner's voice. The password must be spoken in the same way and tone as what is recorded. The diary also has a secret compartment which uses a second password to open it up. The journal comes with an alert which will let you know when somebody has attempted to open your diary. Lastly, this journal includes a pen with invisible ink. An enclosed special light is the only means to see what has been written. The journal is light purple in color, includes a scroll style on the front and includes adorable stickers to individualize the book. Want to see other diaries which you can give to your little daughter? Check out this page for many other choices. Whatever diary you decide on, your girl will certainly be over joyed with the gift.